The most expensive beer in any bar in the world? There might, I suppose, be a bar selling BrewDog Tactical Nuclear Penguin or Sink the Bismark for, what, three times the store-bought retail price, but even that wouldn’t beat it. And admittedly this is a beer that has spent a year maturing in the caves of Champagne (that’s “cellars”, incidentally, and not, as one English beer book that came out last year claims, “caves”), in 75cl corked bottles, reaching 11.5 per cent alcohol by volume. It’s also an excellent brew, sharp and subtle, creamy and invigorating, and deserving of the label that the same book put on it, “an ideal wedding beer”. But I’ve bought bottles of this in an English off-licence for less than £15, and it’s been on sale in good restaurants in London for only (“only”) £35 or so. However, if you were insane enough to order a bottle of Deus Brut des Flandres, brewed by the Bosteels brewery in Buggenhout, Belgium (best known, probably, for another excellent beer, Kwak) in the Belgian Cafe Bar at the InterContinental Hotel in Abu Dhabi, capital of the United Arab Emirates, what do you think you might be expected to stump up? I’ll give you a few facts before revealing the answer: an “ordinary” bottle of Belgian speciality beer here will cost you 40 dirhams, just over £7, though this isn’t much different than you would pay, probably, in a smart hotel bar in London, where a small bottle of Meantime pale ale, £1.50 or so in Waitrose, is £8 in somewhere like the Met Bar in Park Lane. This is, however, also the country where someone believes there’s a market for chocolates that cost $250 each – yes, £164 for one single two-inch chocolate truffle. So: you’re having a night out in what is probably the best bar in Abu Dhabi (though this is, to be truthful, like being called “probably the best football team in the Faroes” – there aren’t very many and they’re mostly rubbish), you’ve decided to show off and you’ve asked the friendly Filipino bar staff to pop the cork off a big bottle of Deus. What figure is going to show up on your credit card statement? 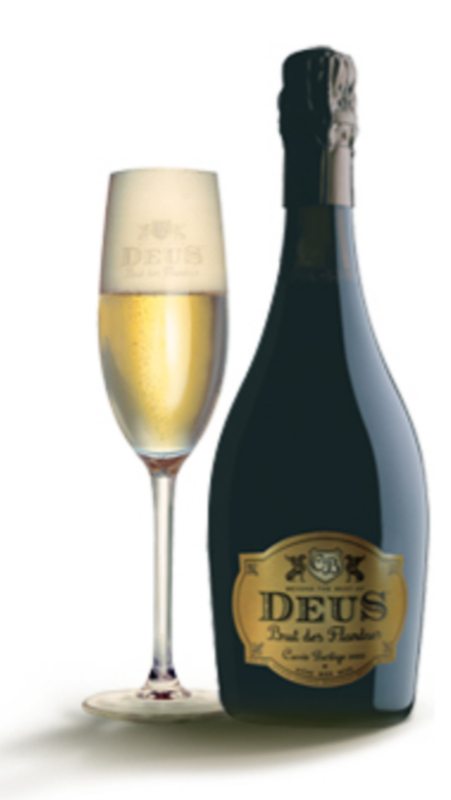 Save some of the Deus to steady yourself with, because that one bottle will cost you 700 dirhams, £125 at today’s exchange rate, $190 US (€145 for you Europeans). You could buy the half-bottle, but even that will be 350 dirhams, £62.50. Or you could wait until you get back to Britain and buy 12 gallons of Stella Artois from Tesco for the same sum (they do also sell Stella in the Belgian Cafe Bar, but I’ve never been stupid enough to buy that there, either). €10 in the AD Delhaize on Boulevard Anspach, and worth every cent. Just. A friend bought a bottle of Samuel Adams Utopias for about 200 GBP in a Swedish pub. So that would be more expensive, and now that it’s available in some Norwegian pubs a full bottle would probably cost you more. He was smart enough to share the bottle with friends, by the way, so he’s not completely insane. I must admit I’ve been too tight to fork out for Deus in Britain, I’d have no hope in the UAE! I have some idea that the Bierodrome in Kingsway had some bottles of lambic or something rare and Belgian on their menu in the 4 figures. Don’t they have Amstel, or would that be an uncouth sacrilege? This one is not current, only of historical interest since it is from around 30-35 years ago…. But there was a bar in the states, in New Jersey back in the mid/late 1970’s, that for a long time had three bottles of Ballantine Burton Ale (brewed in May 1946/ bottled December 1960) on offer for a then whopping $150. …surely a curiosity back then (as was the bar itself, with it’s multiple taps of rarely seen beers…a few years ahead of it’s time). There _were_ beer afficianados (as evidenced by the owner’s knowledge as well as the business this place did), but true beer geekery had not yet become widespread. The bottles, by the way, were gone in the months before the bar closed. Maybe the husband and wife owners of the place drank them (they knew their beers and would have appreciated the spcial nature of the Burton), or perhaps they gifted them to some lucky regulars…but _if_ someone actually bought them, it means that with inflation taken into consideration the $100 asking price would be the equivalent of paying almost $350 today.